The BG-Sentinel (a.k.a. the BG trap or BGS trap) from Biogents is a result of more than sixteen years of academic research into the host-finding of mosquitoes. It is a mosquito trap used by mosquito professionals worldwide. In combination with the artificial human skin scent, the BG-Lure, it is widely considered the gold standard for the sampling, monitoring, and surveillance of the vectors of dengue, chikungunya, Zika, and yellow fever (Aedes [Stegomyia] aegypti, Ae. [St.] albopictus, Ae. [St.] polynesiensis). With the addition of carbon dioxide, the BG-Sentinel is an excellent surveillance tool for mosquitoes in general. is an excellent general mosquito trap when used with CO2. The BG-Sentinel mosquito trap is essentially a collapsible fabric container with a white lid with holes covering its opening. The diameter is 36 cm (14 inches), and the height is 40 cm (1.3 feet). In the middle of the cover, air is sucked into the trap through a black catch pipe by an electrical fan, drawing approaching mosquitoes into a catch bag (blue arrows). The air then exits the trap through the white cover, generating ascending currents (red arrows). These are similar to convection currents produced by a human host, both in its direction, its geometrical structure, and, due to the addition of the BG-Lure, also in its chemical composition. Interesting for professional researchers and mosquito specialists: The BG-Sentinel is large enough to incorporate additional attractants such as fragrant substances, small living animals, worn clothing, animal hairs, light, and heat sources, etc. This makes the trap a very versatile tool for both monitoring and research. Different variations of the BG-Sentinel can be used according to the target species, the study aim and conditions in the field. 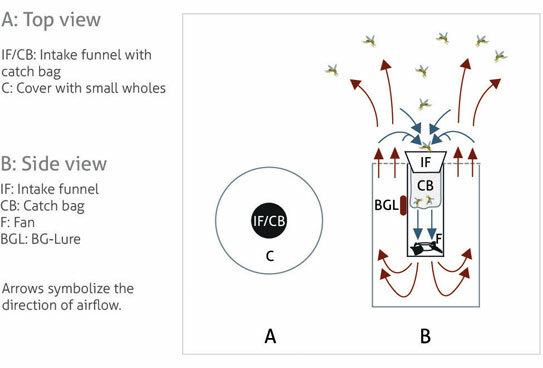 The trap can be used with or without carbon dioxide, and with Biogents’ proprietary human scent imitation for a anthropophilic mosquitoes (such as Aedes aegypti or Culex quinquefasciatus), the BG-Lure. We also offer a kit to add UV-light for biting midges (Ceratopogonidae) and other species that are attracted to ultraviolet light. The BG-Sentinel needs a 12 V DC energy source. 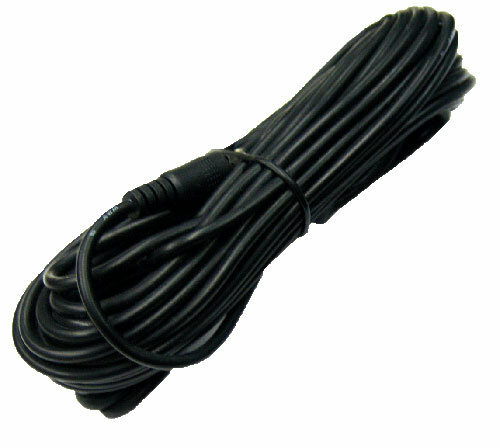 For a use on the electricity network, Biogents supplies mains adaptors. In the field, the traps can be hooked up to batteries. For normal field conditions, we suggest the use of motorcycle batteries which are readily available in most regions of the world. A capacity of 11 Ah is needed for every 24 hours (this includes a security factor). 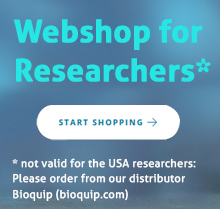 All variations and available accessories can be found in the product catalog for researchers. When used in combination with Biogents proprietary artificial human scent, the BG-Lure, the BG-Sentinel is an excellent monitoring trap for yellow fever mosquitoes, their relatives from the genus Stegomyia, and other anthropophilic species. The BG-Lure releases an artificial skin odor (ammonia, lactic acid, and caproic acid) in a finely tuned ration similar to that of human skin. A version of the artificial scent which gives off smaller quanities of the active ingredients is called BG-Sweetscent. Due to its form and design, the BG-Sentinel also permits the researcher to use highly diverse attractants, including alive animals as lures or a number of other stimuli, thereby adjusting the capture spectrum precisely to specific needs of the study. When used in combination with carbon dioxide, the BG-Sentinel is an excellent monitoring trap for mosquitoes in general. The gas is released from an opening above the trap, thereby adding a smaller CO2 plume to the upwardly directed scent plume in the trap. This mimics the natural spatial distribution of body scent and breath. The trap receives a controlled supply of carbon dioxide from a compressed gas cylinder: A special pressure reducer enables the adjustment oft he pressure and the flow rates to the local and seasonal conditions. We recommend a flow rate of 0.5 kilograms per day (red marker on the display of the pressure regulator). In contrast to dry ice, gas cylinders can be stored until use with no trouble. This permits a flexible response to changes in the weather, and makes it possible to use the traps at an ideal time. The gas cylinders are the same that are used for draught beer and the production of carbonated drinks in pubs and restaurants. This configuration of the trap is currently also being used by the Friederich-Löffler-Institute in the Germany-wide mosquito monitoring project called “Geographical and seasonal distribution of endemic and invasive mosquitoes in Germany”. In this project, around 60 BG-Sentinels with a CO2 supply are being used at selected locations throughout Germany to determine the spectrum of the mosquito species. In 2011, the species captured in this project already included adults of the invasive species Aedes albopictus, Ae. japonicus and Culiseta longiareolata (Werner et al 2012). Dry ice can also be used if preferred. In this case, the gas can be liberated from an isolated container with dry ice 30 to 40 cm above the intake funnel of the trap. Positioning is an important factor for the catch rates. Test different locations! 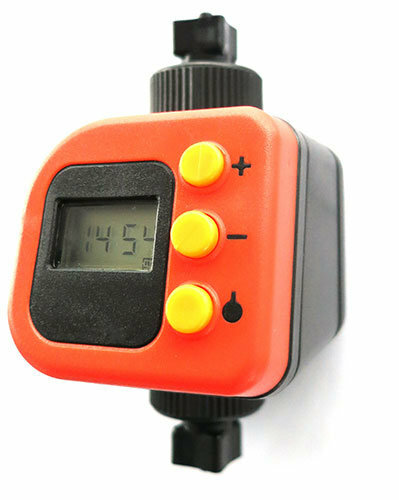 To reduce your CO2 costs the BG-CO2 timer allows you to control when CO2 is released by establishing specific start and stop times. It enables you to set up two start and end times to release CO2 each day. Prices can be found in the product catalog for researchers. The BG-Sentinel can be purchased by contacting our customer support by e-mail sales@biogents.com or by fax (+49 941 5699 2168).